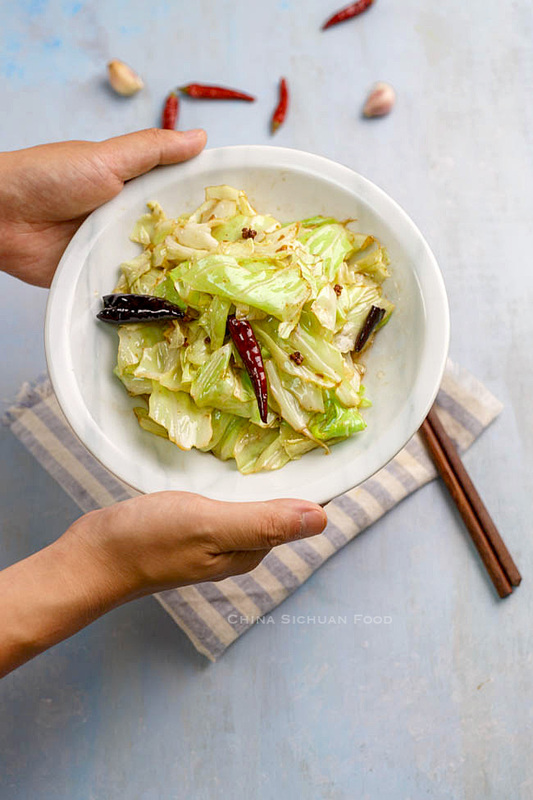 This is one of the most common easy stir-fry dish on my table- Chinese style spicy and sour cabbage stir-fry. 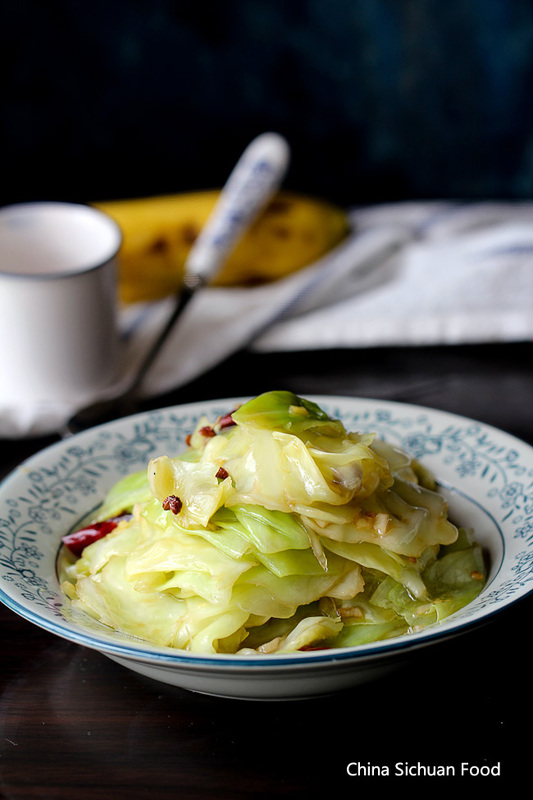 The Chinese name for this easy cabbage stir-fry dish is hand torn cabbage (手撕包菜). You may wonder why it should be hand tearing? Not cutting? Hand shredding can help to remove the tough part of the cabbage and keep the natural grains of the cabbage leaves. We cook the cabbage in a very short time and this type of quick frying can remain the crispy taste of the cabbage. If you happen to have Sichuan peppercorn and black vinegar at home, this is really a must try dish. Making this at home is so easy but it comes out super great and yummy. In my mind, it is the best way to cook cabbages. 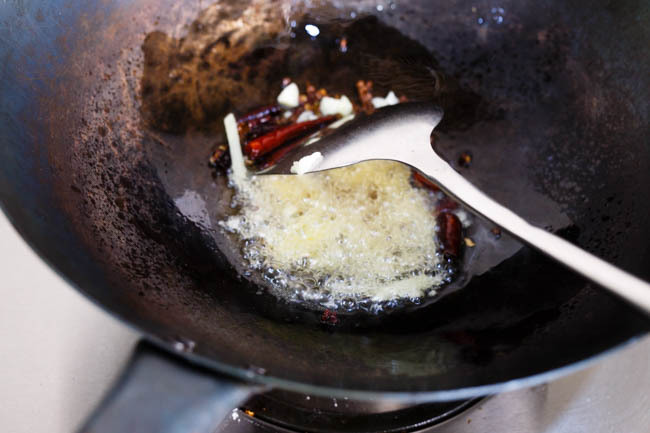 Heat your wok or pan at first before adding the oil. Since we are doing a quick frying, we need enough hot kept by the wok. 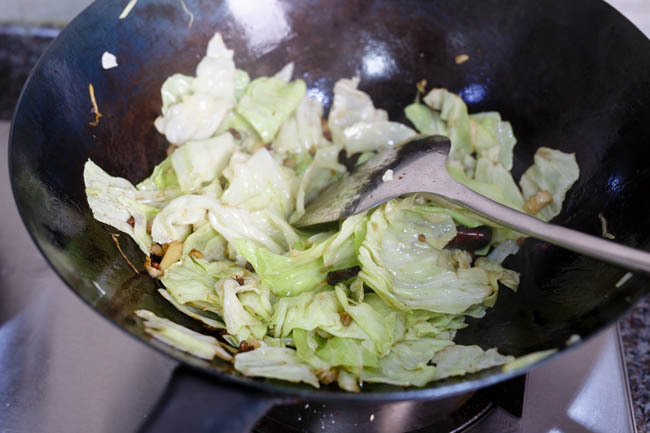 Take full usage of the wok heating by moving the cabbage around the wok. The cabbage should be completely drained before frying. Only water on the leaves can spoil the dish by turning quick frying process into steaming or poaching. Hand tear the cabbage, keep the tender green leaves only. Discard the hard white pate. Wash gently and drain completely. This is the key step to guarantee the success of the dish. Heat the wok firstly, pour in oil. Add dried chili pepper and Sichuan peppercorn too to fry over slow fire until aromatic. Then place in garlic and ginger. Add cabbage immediately. 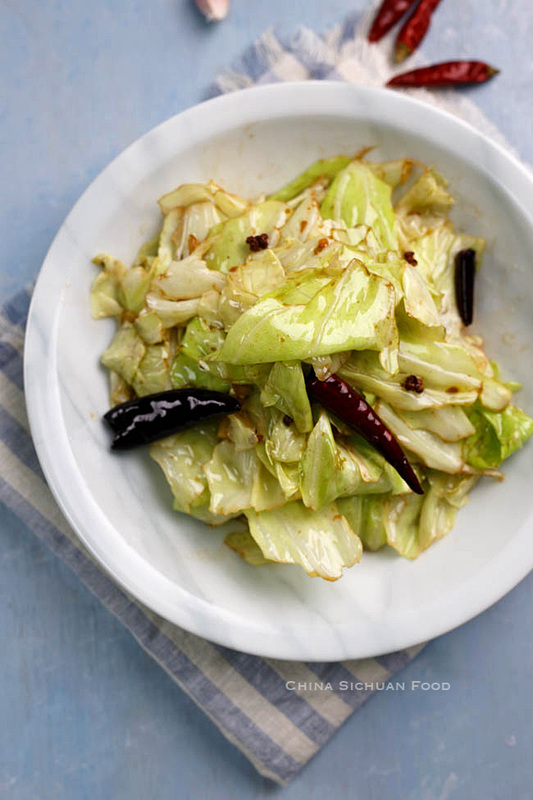 Quick fry the cabbage, add salt, light soy sauce and vinegar. This process should be finished within 30 seconds. 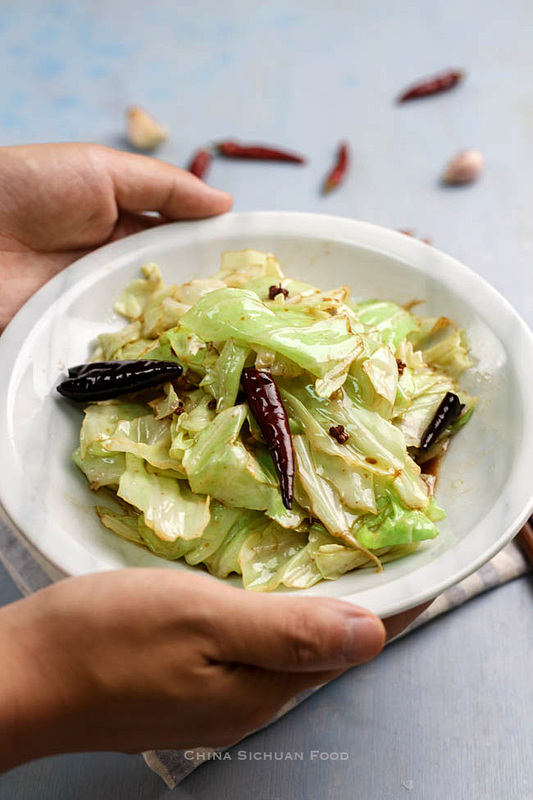 Easy Chinese style cabbage stir fry–hot and sour in taste. Add cabbage immediately. 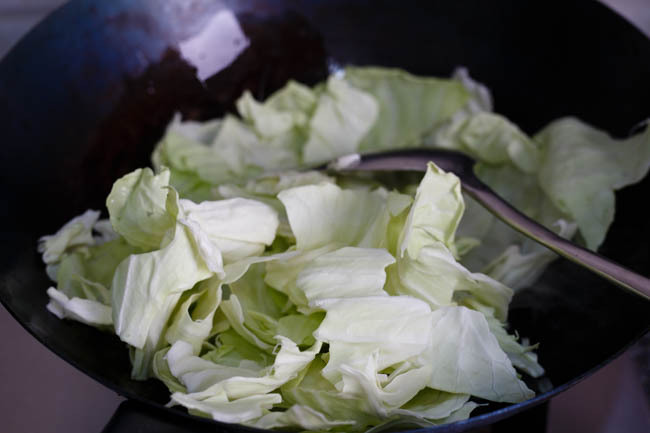 Quick fry the cabbage, add salt, light soy sauce and vinegar.This process should be finished within 30 seconds. You can also add some protein in this recipe like bacon, pork belly or sausage. 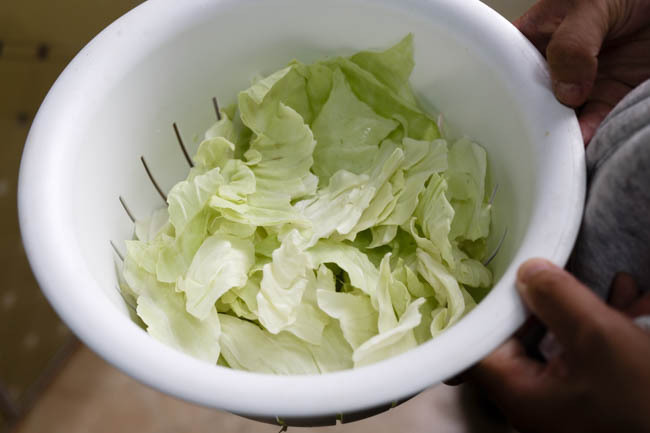 In order to make sure that the flavor is well absorbed by the cabbage, drain the leaves completely before frying. Recipe is firstly published in 2014 and updated in 2018.